The manic researchers confirmed that “absolutely nothing could stop [them]” from finding an immediate cure for depression. BLOOMINGTON, IN—Speaking loudly and quickly without any notable pauses, a team of manic researchers at Indiana University announced at a press conference Wednesday that they are mere hours away from a permanent cure for depression. The wide-eyed, unblinking scientists, who paced back and forth along the podium while nodding their heads vigorously, told the assembled press corps that after they rounded up several hundred test subjects and carried out multiple clinical trials, they expected to have a fully effective treatment for the mood disorder ready by this evening. Punctuating their statements with broad, forceful gestures, the scientists explained that they were now making “15 or 20 medical breakthroughs a minute” and had written more than 350 pages of an academic paper during the morning that they intended to submit for publication immediately. Several times throughout the press conference, sources confirmed that the manic scientists alternately shouted at the press corps to get out of the room to let them think, and then directly challenged the reporters to “name any disease,” asserting that they would cure it on the spot. The ecstatic researchers, who confirmed that their minds are working better and faster than they ever have before, estimated that as soon as they wrapped up their clinical analysis this afternoon, they would immediately receive congratulatory phone calls from the National Institutes of Health, the Bill & Melinda Gates Foundation, every major pharmaceutical company, the U.S. surgeon general, and the Nobel Prize committee. The team of researchers, repeatedly pausing to scribble down ideas on notepads and mop beads of sweat from their brows, assured reporters they did not need to sleep and would immediately turn their attention to shepherding the product through FDA safety evaluations, vowing to bring the drug to market and personally administer it to every American with a depression diagnosis by the end of the week. “Actually, you know what? I’m going to go do that now,” he added before briskly striding off the podium. 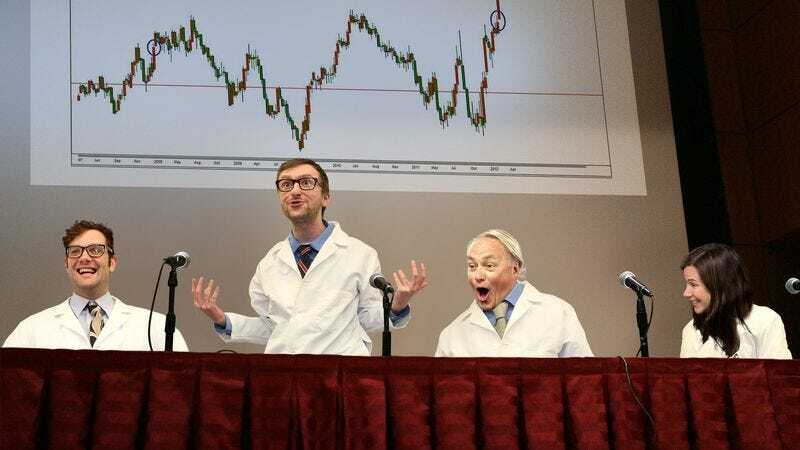 As of press time, however, each of the scientists had reportedly slumped to the ground in tears, saying all the research they had ever done was “completely worthless” and admitting that clinical depression is likely impossible to cure.